Advice on Buying a Piano. Piano Buying Advice & Information. Only a small percentage of new Pianos for sale today are well made, especially when looking at the cheaper ranges. Many uprights from the Far East which sell for under £1800.00 are by opinion of poor quality, having uneven tone, action & tuning problems after a few years. We recommend finding a good second hand one or buying a top reconditioned one from the 1920s or 30s. A good restored piano from the early 1900s is likely to be much better than a cheaper new one. Also modern pianos for sale dating from about 1960 to 1980 are generally better quality than equivalent new ones made today. Touch is to some extent a matter of personal preference, but Pianos with too heavy a touch can be difficult to play expressively. On the other hand, pianos with too light a touch aren't very good for serious beginners as they will not develop sufficient finger strength. New pianos tend to be on the heavy side with a brighter tone, while Traditional pianos generally have a lighter touch and more mellow tone. 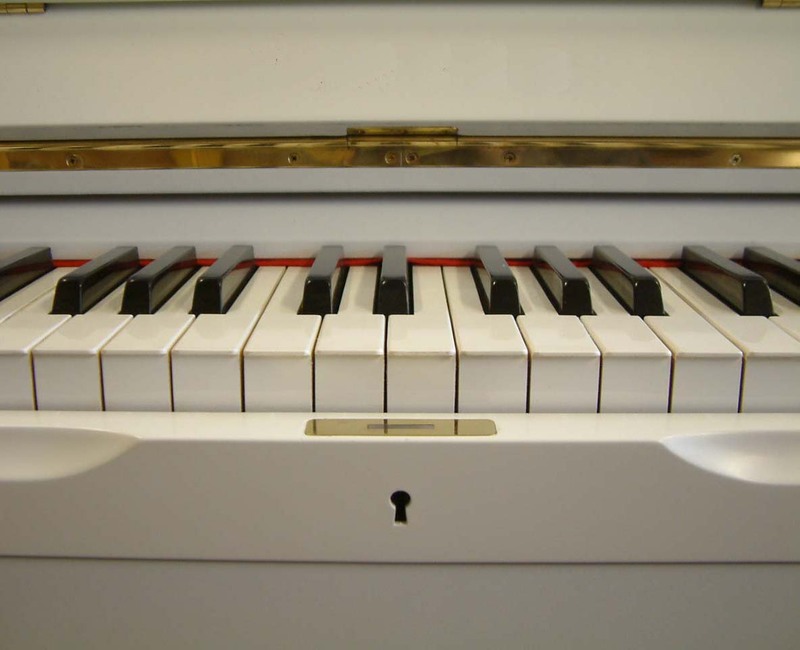 The Acoustic Piano produces sound by striking steel strings with felt hammers that rebound allowing the strings to continue vibrating at their individual resonant frequency. These vibrations are transmitted through to a soundboard, which amplifies each of the notes. Although not portable and often expensive, the acoustic pianos feel and sound is still superior to ANY digital piano. The Straightstrung Overdamper Piano generally are smaller and cheaper than overstrung pianos. With vertical strings & dampers above the hammers, most piano dealers dont buy or supply these pianos. The Overstrung Underdamper Piano, all new pianos made today are overstrung (base strings cross over the treble strings) & underdamped (the dampers are under the hammers as opposed to a overdamper where the dampers sit above the hammers), these are superior when compared to a overdamped piano stopping each note much more effectively, depending on the individual piano these are suitable for beginners to accomplished pianists. In general, if you find a reputable piano retailer, buying a New Piano should be no problem. The choice of piano is yours, and the amount you pay will in general determine the quality of the instrument. When you find a piano that satisfies your needs, purchase the one you have tried, as another of the same make and model could be quite different in touch and tone. Once again, buying from a reputable retailer should not be a problem, as the Second Hand Pianos will have been professionally restored where necessary, and it should be covered by a warranty. However, beware of poorly restored pianos, or instruments with only 'cosmetic tidying up' sold as'fully restored'. Straightstrung or Overstrung: In a straightstrung piano, the strings run parallel to one another throughout. An overstrung piano has the bass strings running diagonally across the piano, crossing over the treble strings - hence overstrung. Overstringing is preferable, as the strings are longer than is possible otherwise, and this produces a much better tone. If a straight strung overdamper piano is in good condition, it can be satisfactory. Overdamper or Underdamper: In an overdamper action, the hammers (the action parts which strike the strings) are obscured from view (when looking into the top) by a wooden rail holding the dampers (the action parts which press on to the strings to stop them from sounding). An underdamper action has the dampers located beneath the hammers and they are usually much more effective than overdampers. Soundboard and Bridges: The soundboard is the varnished wooden panel which can be seen underneath the strings. The bridges are lengths of wood, glued to the soundboard, into which metal pins are driven. The strings run over the bridges and between the pins. The vibration of the strings is transmitted to the soundboard by the bridges, and this produces the sound you hear.